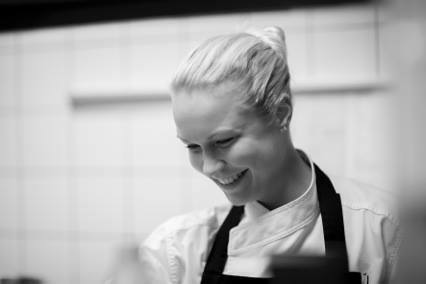 Nordique has caught up with the incredibly talented Finnish chef Hanna Leinonen to discuss some of the amazing aspects of Nordic cuisine. Originally from a small town in Finland called Järvenpää, Hanna has lived and worked in Helsinki for many years before deciding to move abroad. Nordique: Tell us more about the journey that you have taken so far! H: "I never knew I wanted to be a chef, it happened almost by chance. I was applying to university but I started to think that it wouldn’t be the right choice for me. I have always been a person who likes to do things in a practical, creative way. Culinary school was my random second choice for further study, and I was lucky enough to be able to switch and earn the last spot in the class that year. It turned out to have been one of the best decisions of my life so far. I found everything about it interesting and the more I learned, the more my passion grew. I was lucky to fall in love with this job so fast. " "I have been working in many great restaurants in Finland. In the early years I had some great guidance and awesome mentors, people who are to this day close friends and very important to me. Those people gave me the drive to go forward, and push myself forward on this industry and on my own abilities being creative and pushing my boundaries. I worked in different restaurants in Finland for about eight years. I learned a lot new things, and lot about myself as a chef. In the last three years in Finland I was specialising mostly with desserts and pastry, which is very close to my heart and something I enjoyed a lot." Yogurt, blueberries, rice and elderflower. "I do both classic and more modern dishes. I love to experiment and work with the flavours and love to combine both savoury and sweet flavours in dishes.The most important thing is that it always tastes great. I have always loved drawing and painting, so presentation is also very important for me. Eventually I decided that it was time to try something new. I have always travelled a lot, searching and discovering new places and things. I had never worked abroad though. I decided to give Australia a go - it has so many different cultures and cuisines, so I thought there must be lot to see and learn. So on midsummer night in Finland 2015, I decided to make the leap. I needed see, explore and learn new things. The same night I applied for a visa to Australia and booked my one way flights. I'm so happy with how things have worked out!" Beetroot, liquorice and goats cheese. Nordique: What do you love about Finnish food? H: "I love the simplicity of it. Especially with all the products that the beautiful nature has to offer. From the freshwater lake fishes, to autumn forest mushrooms, forest berries and all growing wheat, rye and grains. Living that far North you need to know how to preserve those summer season goodies for the long cold winter when not much is available. It helps to develop a unique and interesting food culture." Forest blueberries, yogurt and violets. Nordique: How does the food culture differ in Australia from your home country? H: "I have always wanted to maintain a link with Nordic and Finnish recipes over here, even though the right ingredients are often very difficult to find. Especially when I like to make things such as ryebread, karelian pastries, cinnamon buns, malt bread etc! I always need to make some compromises about traditional recipes here but the end products have been surpisingly good, and something new and exciting for people here." "The seasons are obviously totally different here in Australia compared to Finland. Australia has almost endless summer and warmer months. Finland has such a long and cold winter which stops a lot of things growing. Obviously it's also many times bigger country in scale than Finland, so where some parts of Australia something its not growing, you might be able to grow and get it from other states. There are specific growing seasons for different fruit and vegetables though, where some vegetables are only season on one point of year, when one vegetable might be all year around in season. And of course at Christmas the food is very different! In the Nordic countries, Christmas dinner is about a big, hearty meal with pickled, smoked and cured fishes and root vegetables. Here in Australia it is the middle of summer, and so Christmas dinner is more about fresh seafood on barbeque at the beach!" Nordique: What do you miss the most about Finland living abroad? H: "I obviously miss my close friends and family from Finland, being so far away. Finnish nature is something that you cannot experience here. I often miss the beauty of Finnish lakes and forests, and the goodies that you could forage in there." Nordique: What are your signature dishes? H: "It would be definitely a dessert with Liquorice, carrots, sea buckthorn and dill. Liquorice is one of my favourite ingredients, and I love to pair it with root vegetables in desserts. I have done and played with so many versions with this dish, sometimes changing carrot to pumpkin or sea buckthorn to lemon depending on the availability of ingredients, or just my inspiration to do something else." Carrot, sea buckthorn, liquorice and fennel. Nordique: What's next in your food adventure? Are you staying in Sydney? H: "I'm currently living in Sydney, but I'm moving back to Melbourne at the start of next year. I lived in Melbourne for over a year when I first arrived in Australia and that city has been close to my heart ever since. I would also like to go on and explore more countries in my career in the coming years to expand my knowledge."